We Will Buy Your RV or Consign it for FREE! 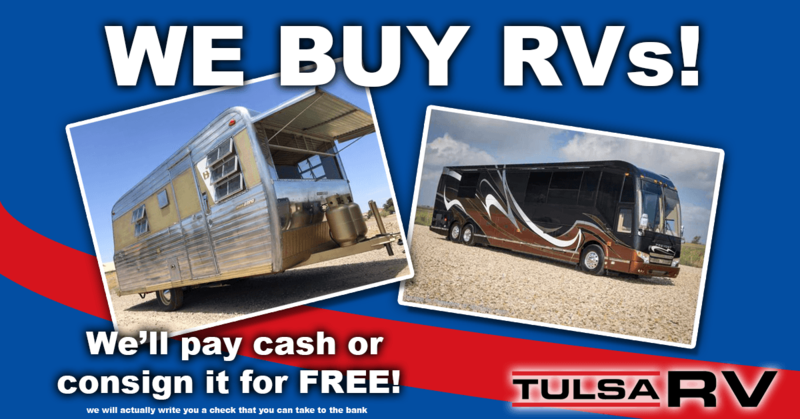 TURN YOUR RV INTO CASH –We Will Buy It or Sell It For You FREE! Not only do we have the largest selection of new recreational vehicles for sale in the region, we also have a wide array of used recreational vehicles for sale as well. This means that Tulsa RV is the BEST place to come to when you’re looking to sell your RV. As the best RV seller in the region we have an incredibly strong customer base and a knowledgeable and friendly sales staff to help sell your RV to an eager buyer! No other online marketplace can compete with the selection of used recreational vehicles for sale on TulsaRV.net! An RV can give you unprecedented freedom and comfort for your travel and camping needs and we know that once you view the selection on available on our site, you’ll see that we’re the best source for your recreational vehicle needs.